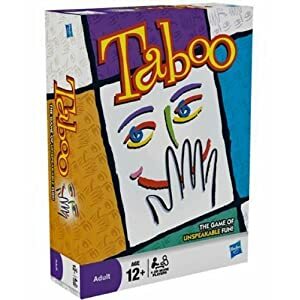 What are some of your favourite/least-favourite board games? Stratego, the traditional version, is my favourite board game. It is the only game I own (compact case, so it fits well with my now small library). Scrabble, Clue, and Risk are my trifecta, although the only one I've played recently is Scrabble. Risk is a good game, but it is so hard to find people to play the game to the end. The last time I played, I won it. Since I have no idea when I will play a game to completion again, I think that may be a final victory. And who I beat is a bit irked. He was too defensive and let me ultimately gain far more territory than he could. I was so spread out in the beginning, I thought I was a goner for sure. 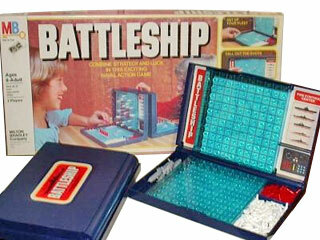 I tried playing Risk once, but I couldn't figure out the instructions. Catan, Scrabble, Scattergories, and not Monopoly. I hate Monopoly. I really don't care for chess -- too hard for me to keep track of. I know how to play, but not how to win. The pie game! I loved playing the old Genus edition back in the mid-2000s - you had to try to guess the answer circa very late Cold War, IIRC. 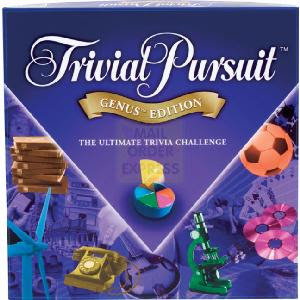 When I was growing up, we had (still have, probably) a version of Trivial Pursuit from the '80s or maybe early '90s. My friends and I used to play all the time in high school and some of my friends could answer almost every question. I ran with a brainy crowd when I was 16. My favorite was feudal. Unfortunately it's out of print and I don't know what happened to my parents set.